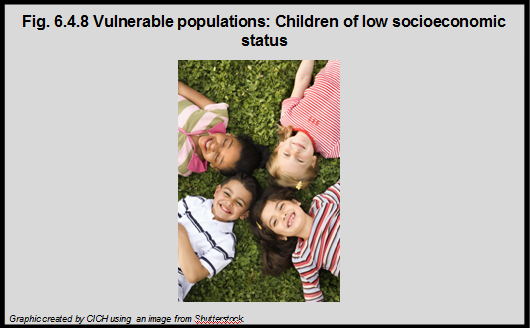 Children who live in low income households are more vulnerable to the effects of climate change. They are also more likely to share smaller living quarters with more people, which contributes to a warmer living environment. In addition, lower quality housing is more likely to be damaged by climate-related events such as heavy rain which could lead to flooding or the development of mold. Families living in these homes may struggle to cope with the hardships and to find the finances to repair the damages. 1Nugent, O., for Pollution Probe. (2004). A Primer on Climate Change and Human Health. http://www.pollutionprobe.org/publications/primer-on-climate-change-and-human-health-accessed July 24, 2017.